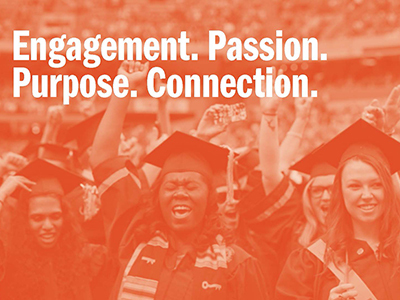 Each year, Syracuse University designates two rising seniors to lead their class as the all-University student representatives for Commencement. Applicants must be current undergraduate students graduating in May 2018. The deadline to apply is Friday, Jan. 27. Senior Class Marshals play a significant role as student leaders throughout their senior year. In addition to leading the Commencement procession, these students meet with senior-level administrators to share and offer feedback on their student experience, participate in networking events, serve as representatives at University-wide events and recommend speakers for their Commencement ceremony. “Being a Senior Class Marshal has meant having the opportunity to proudly represent my class and the passion and ingenuity that define us. It’s about thanking the people at this university and my family and friends for helping me grow intellectually, civically and spiritually. It feels like a collective honor,” says Rachel Brown-Weinstock, a senior in the College of Arts and Sciences and the Maxwell School of Citizenship and Public Affairs and Class of 2017 Senior Class Marshal. Applicants must submit a completed online application form, an essay and an official SU transcript. Two recommendation letters are also required. Staff and faculty are also invited to nominate May 2018 graduates for this honor using the Senior Class Marshal online nomination form. For more information, visit the Senior Class Marshal website. Questions can be directed to 315.443.9153 or ahumphre@syr.edu.